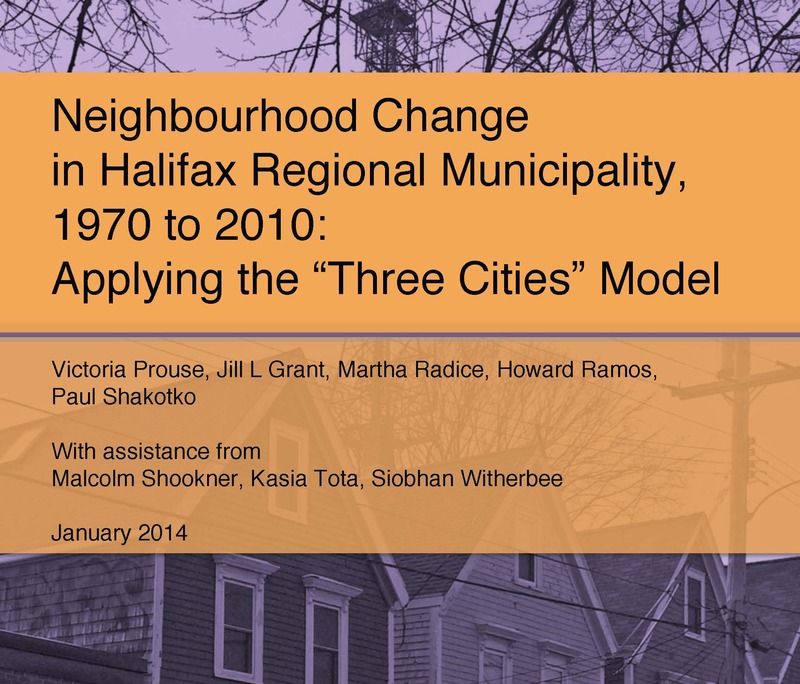 Neighbourhood Change in Halifax Regional Municipality, 1970 to 2010: Applying the “Three Cities” Model, by Victoria Prouse, Jill L Grant, Martha Radice, Howard Ramos, Paul Shakotko. With assistance from Malcolm Shookner, Kasia Tota, Siobhan Witherbee. Census data & mapping, Richard Maaranen, University of Toronto. This report provides an analysis of the income inequality and income polarization trends within the Halifax region over the period 1970 to 2010. By defining income inequality as the increasing dispersion of income levels in a particular area and income polarization as the degree of dispersion, the report examines local, regional, national, and global factors that have influenced the patterns of neighbourhood transformation from over a forty year period with particular attention on 1980 to 2010 because of the comparability of data. Although it is clear that Halifax has pockets of poverty and disadvantage, and that individual incomes have been increasing on the Peninsula, our application of the Three Cities model to census data for Halifax suggests that at the census tract level Halifax does not appear as starkly polarized as Toronto or Vancouver. Halifax is not a “divided city,” although it does have areas of poverty and affluence in close proximity. Longitudinal analysis offers limited evidence to support the premise that trends in socio-spatial inequality have worsened dramatically in Halifax over the last 30 years. Unlike large cities that have experienced significant growth in areas of extreme poverty and extreme affluence, Halifax has seen subtle but meaningful neighbourhood change. The Neighbourhood Change Research Partnership is funded by a Partnership Grant from the Social Sciences and Humanities Research Council of Canada. The Halifax team has received valued contributions from community partners: United Way Halifax, Halifax Regional Municipality, and the Province of Nova Scotia (Community Counts).